I huge fan of connected home technology – specifically, the Nest thermostat. Sure, to the outside observer it may sound odd to drop $200 on a smart thermostat I can control with my smartphone, but my New England condo sees massive energy bills in the winter. Being smart about energy usage just makes sense. But can the same magic that made the Nest smart thermometer work elsewhere in your house? 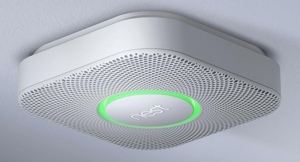 That’s what Nest Labs is betting with Nest Protect, a smart carbon monoxide and smoke detector for your home. Nest Protect trades shrill beeping for more specific alerts. If carbon dioxide is detected, for example, the device will say “heads up” before filling your home with a loud alarm tone. If it needs new batteries, it will politely request them. (Nest Protect also comes in a 120V wired version.) These are small touches, but they’re appreciated. Of course, the real benefit of Nest Protect is its connectivity. Should anything go wrong at your home, Protect will send an alert directly to your smartphone detailing the problem. That way, if you forget something on the stove on the way out the door, your phone will let you know. Beats getting the call from the local fire department, that’s for sure. There’s one more cool feature waiting in the Nest Protect: It contains some very powerful motion sensing tools. False alarm? You can turn it off with a wave of your arm. Making a late night trip to the bathroom? Protect will sense your movement and turn on a gentle light. By 2014, the Nest Protect will be even able to connect directly to existing home security systems. The Nest Protect will go on sale in your choice of black or white this November for a MSRP of $129.99. You’ll be able to find the device at Amazon, the Apple Store, Best Buy, Home Depot or anywhere else Nest devices are sold. You can pre-order the device now at the Nest website. I too received an email yesterday touting the new Nest smoke/CO detector. I have two Nest thermostats and I really like their functionality. While I’m willing to spend money for the thermostats because I expect to recoup my investment over time, I’m not sure I want to spend $129 on a smoke alarm.